Today I’m sharing a recipe for Sultana Banana Mini Pancakes ❤️ They are quick, easy to make and use basic pantry ingredients. 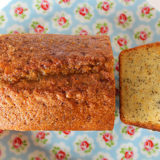 They’re perfect for serving as a weekend breakfast or for ‘elevenses’. 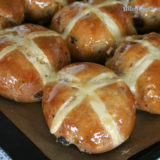 Me and Lil’ L have made them three times so far and they have proven to be a big hit with the family. 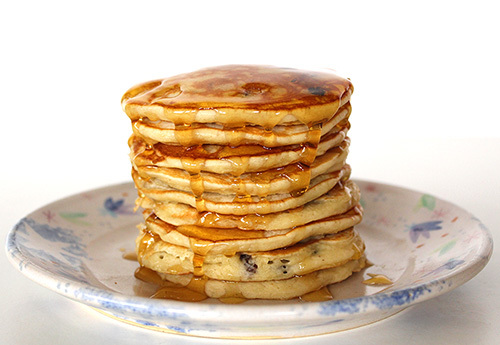 Have you tried adding sultanas to pancake batter before? They work beautifully in these American-style fluffy pancakes. In fact, I loved them so much that I ended up adding more than the original recipe called for. Shrove Tuesday (‘Pancake Day’) is arriving early this year. It’s actually next Tuesday…. February 9th! And if you’re new to veganism, or just fancy trying something a little different, I have my top five vegan pancake recipes to share with you. 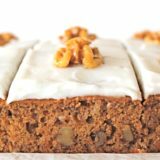 They’re super easy to make and use basic pantry staples that you’re bound to have on hand. Since they’re vegan, they’re suitable for anyone with dairy or egg allergies. They can also be made gluten free. A huge fan of crêpes, Lil’ L declared that he loves this vegan version as much as he loves the crêpes he eats in France. Endorsements don’t come much bigger than that! Fresh Vegan is a digital food magazine for the UK and Europe. 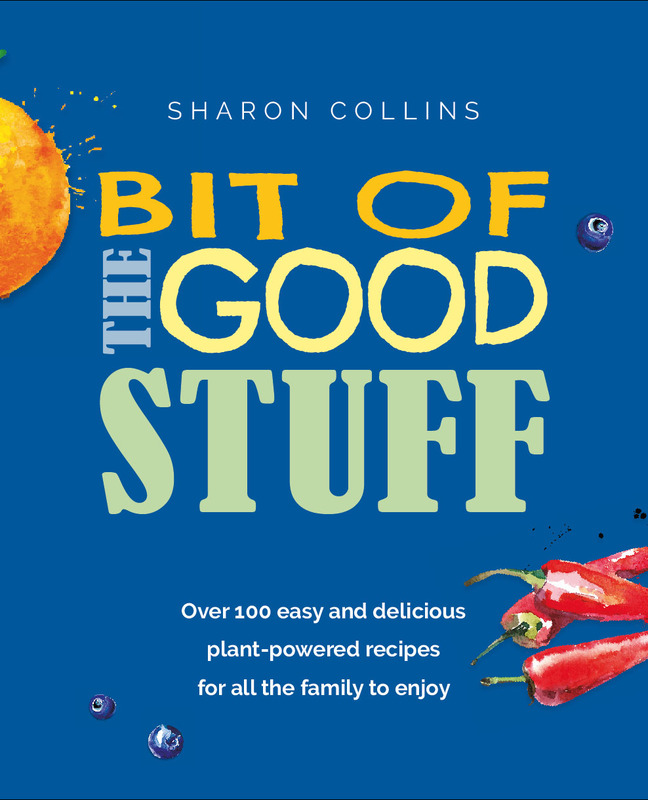 Launched in Winter 2013, the magazine will appeal to anyone interested in plant-based eating, whether they be omnivores, vegetarians, vegans or the health conscious. 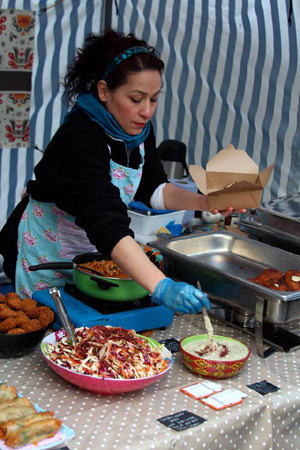 The magazine’s 100+ pages are jam-packed with features, interviews and recipes from chefs, restaurant owners, street food vendors, food writers, authors, bloggers and food producers from all over the UK and Europe. 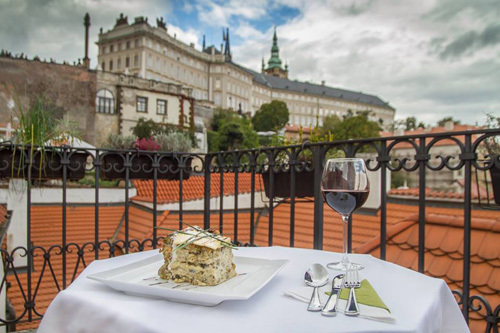 The magazine also has great features on where to eat, sleep and shop for vegan goodies in locations around Europe and the UK. 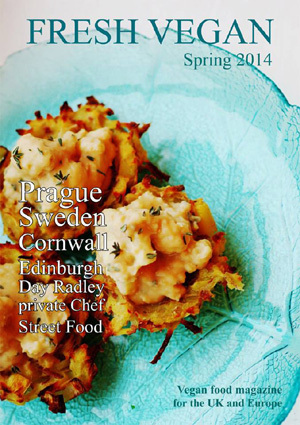 In the Spring issue, the spotlight was on beautiful Cornwall, Prague and Germany. 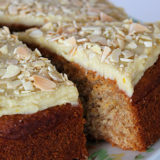 Alongside the features, the contributors share one or more of their favourite recipes. One recipe in the Spring issue that caught my eye was Day Radley’s Banana Notella Pancakes, which happen to be both vegan and gluten-free! I’ve had success with gluten-free American-style pancakes before (my favourite is this Blackstrap Ginger Cookie Pancake), but I’ve never tried a crêpe-style (ie. folding) gluten-free pancake before. Since Lil’ L is such a ‘pancake monster’, I knew this would be a great recipe to share with the family. The pancake was filled with home-made vegan nutella. 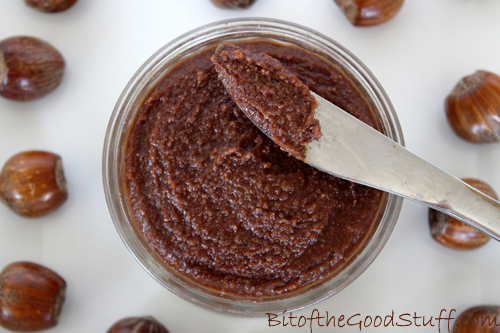 While I’ve made lots of versions of dairy-free nutella in the past (using both raw and roasted nuts), I’d never made one the same way at Day. I was intrigued to give it a try! And the verdict? Both the pancakes and the ‘notella’ were a big hit with the family! The banana pancake had a nice texture and flavour, and while much thicker than a classic crêpe, I was still able to fold it. I trialled the pancakes using Doves gluten-free plain white and brown bread flours, and both worked. The ‘notella’ was really yummy! Day recommends using a blender but I knew my blender wouldn’t be up to the job, so I used the food processor instead. I did need to add more water to achieve a smooth, spreadable consistency and I also added some vanilla extract, but that was just down to personal taste. Preheat the oven to 200c. Put the nuts on a pan and toast in the oven until the skins come off easily. Take out and leave to cool until you can handle them. Rub them between your hands roughly, this will remove the skin. (I roasted my nuts at 180C in my fan oven for 12 minutes until golden brown, then transferred them onto a plate and left them to cool down). Put the nuts in a blender with the syrup, oil and water (I used my food processor). Blend until this is a smooth paste. (This will take a few minutes. Stop now and then to scrape down the bowl). Add the cocoa and blend again. (I then added extra water, one tablespoon at a time until I reached the desired consistency. After taste testing, I also added ½ tsp vanilla extract and blended it in). 2 tablespoons almond milk (I had to add another tablespoon to achieve a pourable batter). Cut 4 slices off the banana, these will be put inside the pancake. Put the rest of the banana into a jug with the flour, baking powder and milk. 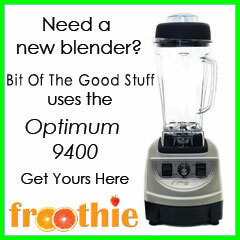 Blend with an immersion/hand blender until smooth. 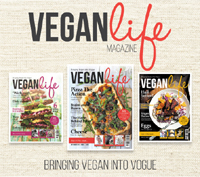 SPECIAL OFFER: Fresh Vegan is offering Bit of the Good Stuff readers the chance to download the Spring 2014 issue in PDF format for just £1.95 (usual price £3.95). Click here to purchase. 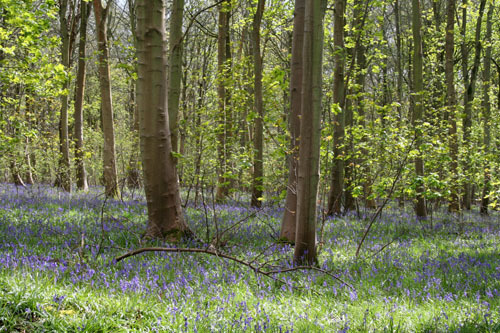 Offers end Sunday 25th May 2014. I’ve posted a few pancakes recipes on the blog, including some of our all-time favourites like Apple Cinnamon, Banana, and Blueberry pancakes. However, I’ve never got round to posting our favourite crepe recipe. It’s high time that I put this right, especially as it’s Shrove Tuesday tomorrow! It’s a common misconception that eggs are an essential ingredient in pancakes. I’ve been making eggless pancakes for years, and I’ve not had one pancake fail yet! If anything, I find the vegan crepes are more robust than the traditional ones. I’m one of those people that’s utterly rubbish at flipping pancakes, so I much prefer a slightly more robust batter that can easily be flipped over with a slotted turner. These crepes are delicious served as a dessert or treat. The traditional way to serve them is with lemon and sugar. You could use ‘regular’ (cane) sugar, but my all-time favourite is coconut sugar. It has the most beautiful, caramel-like flavour which works so well in crepes. As an added bonus, unlike cane sugar, it’s low GI and nutrient-rich. 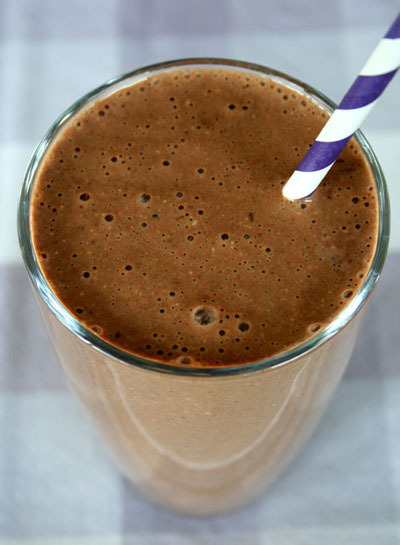 It contains B vitamins, potassium, magnesium, zinc and iron! 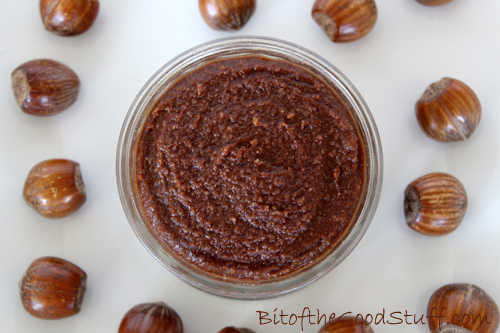 Another of our favourite fillings is Nature’s Store Hazelnut & Cocoa Spread. 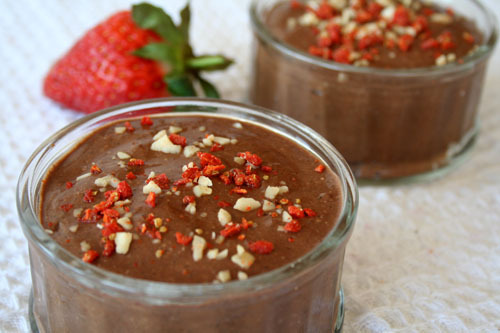 It tastes just like Nutella… but it’s vegan! In the UK, it’s currently available in Sainsbury’s, Tesco and Morrisons. 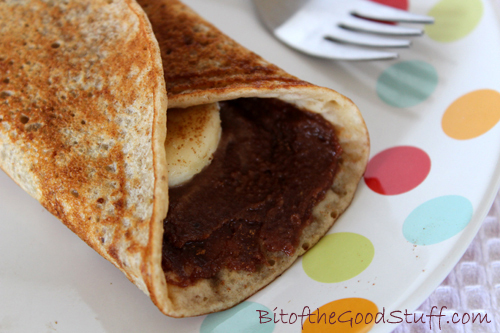 I especially love it as a crepe filling with sliced banana. It’s so good! Sift the dry ingredients into a large bowl, preferably one with a pouring spout. Make a well in the middle, add the wet ingredients and whisk until thoroughly combined. Add a little more milk, if needed, to make a thin, pourable batter. If possible, use two large non-stick frying pans (skillets) to halve the cooking time. Brush the bottom of the pan with oil and heat on medium high. (On my electric hob, I pre-heat the pan on 7, then reduce it to 6). Test the pan is hot enough by flicking drops of water. If they sizzle, the pan is ready. Pour in ⅓ cup of batter and swirl to thin out. When the batter has firmed up and the underside is lightly browned (about 1½ minutes), carefully flip and cook for a further 30 seconds or so. Place in a low-heated oven to keep warm while you cook the remaining pancakes. 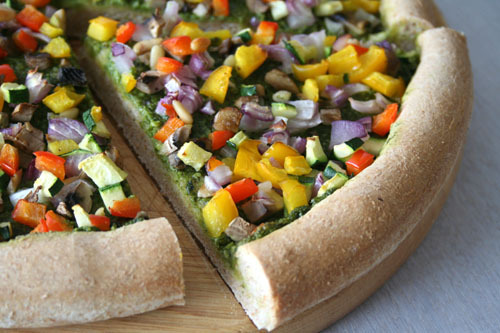 Add your favourite toppings and serve. The batter can be made in advance and stored in the fridge for around 24 hours. 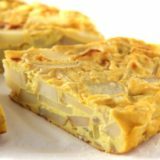 It will thicken up, so whisk in extra milk until you have a pourable batter. Any leftover pancakes can be stored in the fridge. Gently heat through on the hob or in the microwave before serving. For anyone that’s unfamiliar with WIAW, let me briefly explain what it is. ‘What I Ate Wednesday’ is a virtual foodie party hosted by the lovely Jenn over at Peas and Crayons. 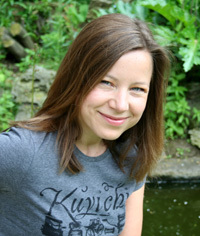 Once a week, we record a day’s worth of eats, blog about it, then share our links on Jenn’s site. WIAW not only helps us to keep track of our own eating habits, but we also get oodles of inspiration from all the photos and recipes that are linked up each Wednesday. Literally hundreds of foodie bloggers now join in every week. It’s immense! Apple Cinnamon pancakes left over from Sunday, which we warmed up in the microwave then topped with chopped pecans, walnuts, ground linseed and a drizzled of agave syrup. Totally delish! The recipe can be found here. For lunch, I devoured this plate of vine ripened tomatoes, red pepper, courgette (zucchini) and carrot, along with a large portion of home-made humous … hummus … houmous? I have no idea which way to spell it these days! 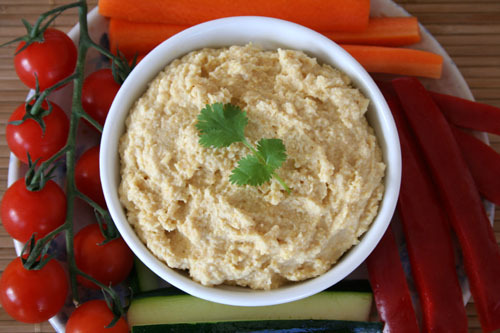 Every individual has their own preference when it comes to the flavour and consistency of humous. For Lil’ L, it mustn’t be ‘too oily’, ‘too garlicky’ or ‘too lemony’. For him, the best hummus ever is served at the Adventure Cafe in Bath. For months, I’ve been playing around with the quantities, trying to get it ‘just right’. In the summer holidays, after yet another attempt, he dipped his cucumber stick into the humous, then uttered the words that I’ve been longing to hear…. “this is as good as the Adventure Cafe humous”. Yay!!! Success at last! Place all the ingredients in a food processor along with 4 tbsp of the reserved liquid. Blend until smooth. Add a little more liquid if required and blend again. Check the flavour and adjust as required. Garnish with coriander and a sprinkling of paprika, if desired. 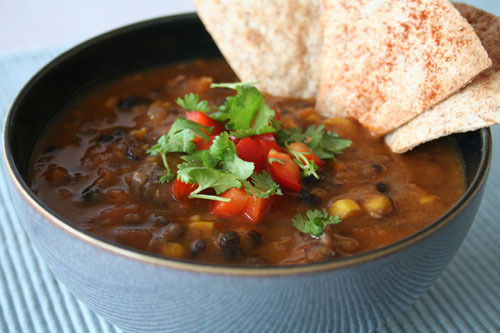 For Lil’ L’s and M’s packed lunch today, they took the Mexican black bean soup and corn bread left over from last night’s dinner. This was totally lush too! Recipe coming soon! Lil’ L and I had a large chocolate banana energy smoothie. Recipe here! I’m seriously addicted to these, as is Rachel! Since the weather’s still mild here, I’m not ready for stews yet. However, it is the perfect time of year for crumbles. I adore both savoury and sweet crumbles. 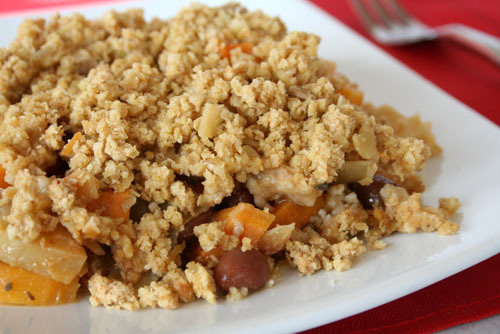 For dinner, I made what I’m currently calling ‘Veggie Patch Crumble’ because it included veggies that I imagine I would be pulling up from the allotment right now… if I had one 😉 It included parsnip, carrot, cabbage, sweet potato, garlic and onions. 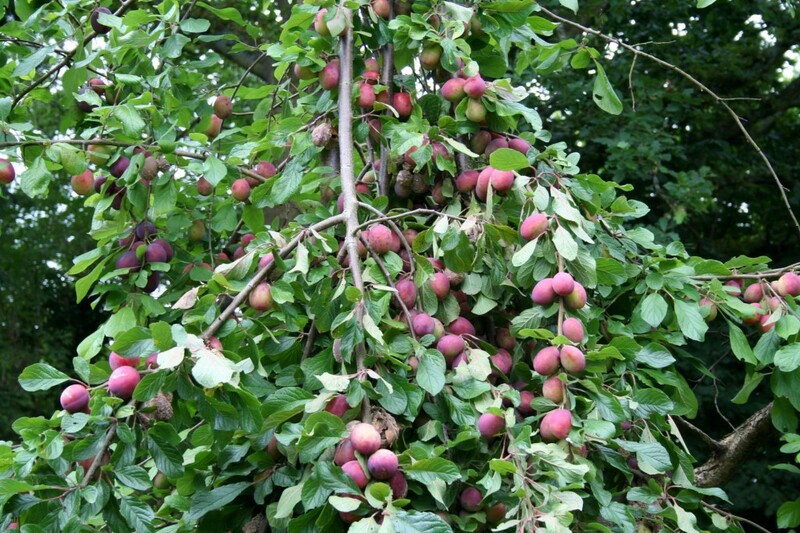 Last year we had a gazillion plums. This year, we didn’t have a single plum on the tree. 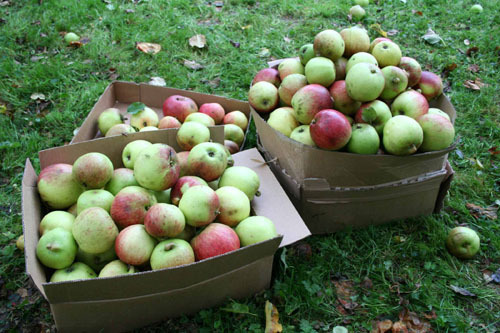 Last year we had box loads of huge cooking apples. 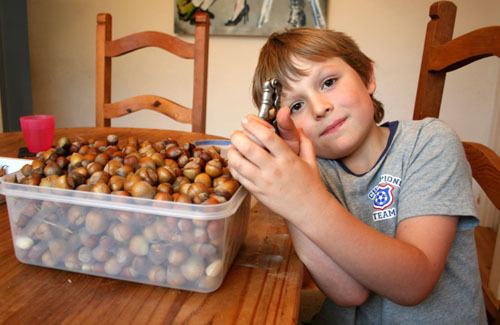 Remember the cob nuts from last year? On the plus side though, our two little strawberry plants have been amazing! We’ve had more strawberries this year than ever before. The plants are still producing fruit, though I doubt whether they’ll ripen up now. Luckily, I had a batch of strawberries in the freezer, which I used yesterday to make some instant frozen strawberry yoghurt. This has been one of our favourite summer desserts and now that I’ve got the food processor, it’s been a breeze to make. You simply throw the frozen strawberries and yoghurt into the processor and press the button. 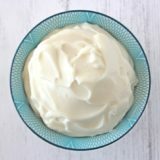 A couple of minutes later, you have soft whip. It was too dark last night to take a photo, so here’s one from last time we made it. We drizzled on some home-made strawberry sauce and, last night, we also sprinkled some home-made granola on top. It was totally scrumptious! 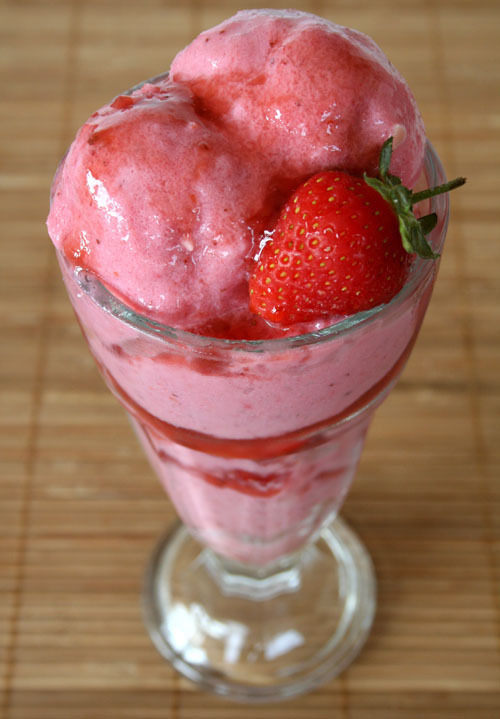 Place the yoghurt and strawberries in a food processor and blend until smooth. Serve immediately as soft whip, or return to the freezer for a firmer frozen yoghurt. If frozen overnight, remove from the freezer 40 mins – 1 hour before serving. It’s so easy to make your own strawberry syrup. Simply mix 4 tbsp of strawberry jam or natural fruit spread with a little water to make a syrup that’s runny enough to pour. I use St Dalfour Rhapsodie de Fruit Strawberry Jam, which is deliciously sweet but has no added sugars (it’s sweetened with grape extract). It’s available from all the major UK supermarkets and some health food shops. So that’s me done for another WIAW! Time to head over to Jenn’s and get inspired! 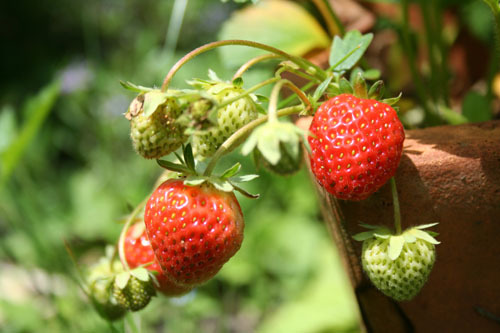 Have you had any success growing fruit & veg this year? If so, I’d love to hear about it. We’re doing okay, although the weather is a bit of a drag. It’s just rain, rain, rain here 🙁 I mustn’t complain though as we’ve had beautiful weather for weeks and the country’s got a water shortage. Although I definitely don’t fancy going out on my bike in this weather, I am happy to walk about in the rain. In fact, it can be pretty refreshing. 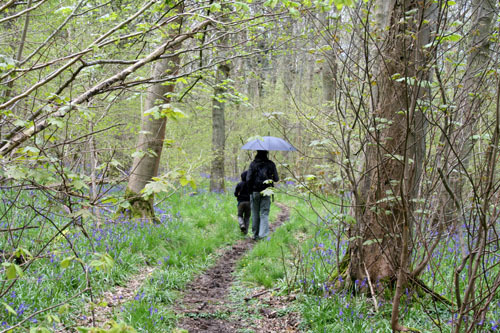 I love the smell of fresh rain and, providing you’ve got a big umbrella, it can be quite cosy and fun. 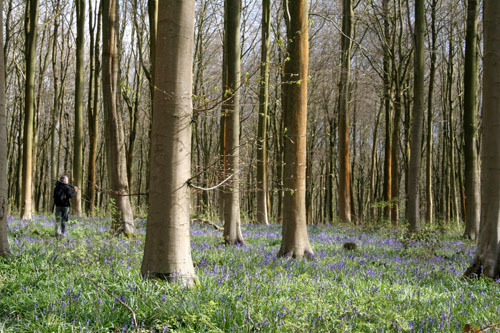 On Saturday, we decided to take a trip to West Woods in Wiltshire to check out the beautiful bluebells. It rained on and off, but that didn’t matter. If anything, it made the trip even more magical as we were pretty much the only ones there. It was so peaceful! 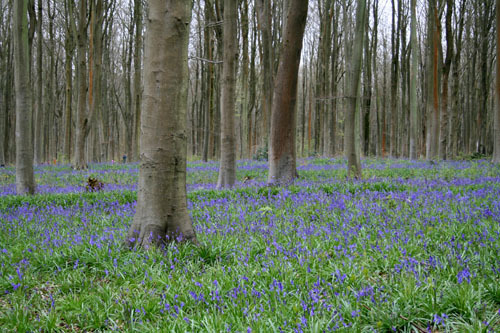 The bluebells were truly stunning! We noticed that there were quite a few bridleways through the forest so, as soon as the tracks dry out, we’ll take our bikes for a ride round. The market town of Marlborough is not far from the woods so, after our walk, we popped there for a coffee. It was market day so before we headed home, we managed to bag ourselves some great value fruit and veggies, including 10 bananas for £1! Since our return from Lanzarote a week and a half ago, I’ve been enjoying cooking some of the family’s favourite meals. Just for a change, for this week’s WIAW party, I thought I’d ask Lil’ L to list his favourite breakfast, lunch, dinner and dessert that he’s eaten since we’ve been home. I made a batch of these on Saturday morning and Lil’ L had them for breakfast on both Saturday and Sunday. These are his number one favourite pancakes. 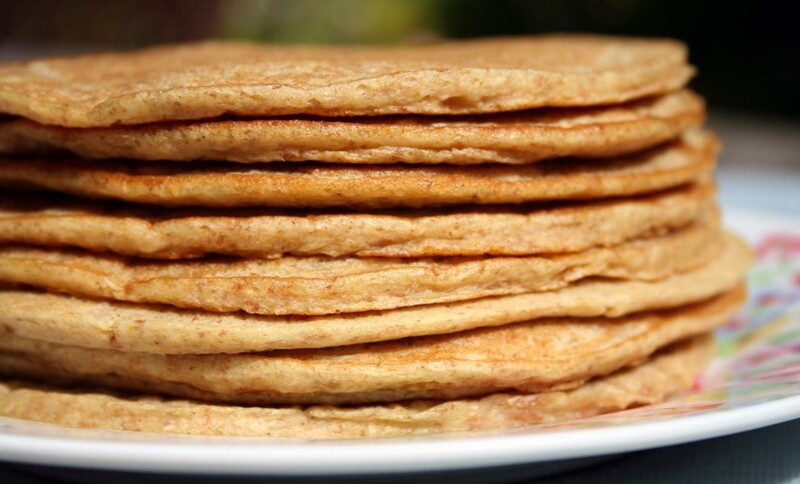 I’ve recently updated the recipe to bring it into line with my other pancake recipes. They are so simple to make; you just throw all the ingredients into the blender and pulse it a few times. 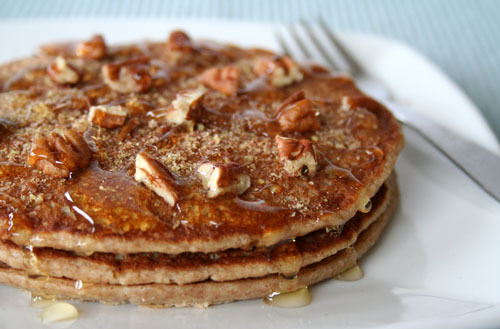 At the weekend, we topped the pancakes with chopped pecans, walnuts, sliced almonds, ground linseed and a drizzle of agave syrup. Since returning from our holidays, we’ve been on a mission to liven up lunch boxes. 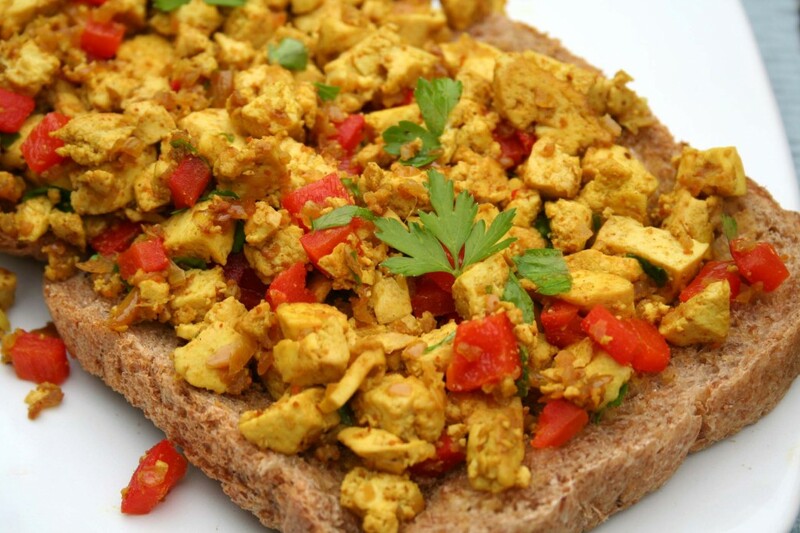 Lil’ L mentioned that he would love to try scrambled tofu in a pitta bread for his school lunch. On Sunday, we made scrambled tofu on toast for our lunch and then saved some for packed lunches on Tuesday. This time round, in addition to the tofu and spices, we added a few veggies – finely chopped red onion, red pepper, sliced mushrooms and flat leaf parsley. Lil’ L absolutely loved the scrambled tofu pitta pocket and said it was one of the best packed lunches he’s ever had. We’ll definitely be making this one again! Lil’ L had difficulty choosing one favourite dinner as we’ve had three of his favourites this week, so he asked whether I could feature all three. 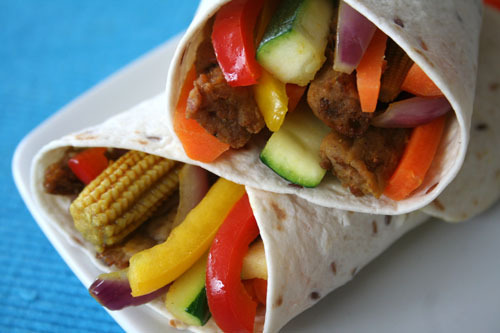 On Monday, we had Mexican veggie fajitas. 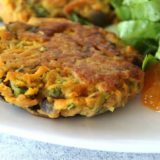 This dinner only takes 8 minutes to make! It’s perfect for Monday nights when Lil’ L has to eat an early dinner before cubs. To make them, I stir fried bell peppers, courgette (zucchini), mushrooms, baby corn, avocado, julienned carrot sticks, roasted broccoli (a left over from the weekend) and pumpkin seeds in a little oil and a sprinkling of fajita spice mix. I also added half a packet of Fry’s Vegetarian Chunky Strips (bought from Holland and Barratt). We served them in warmed tortillas, and M and I chose to spice ours up with a drizzle of Linghams Chilli Sauce. Delicious! Yesterday, my mum came to visit us for the night, so we decided to cook one of the family’s current favourite meals – Veggie Korma with home made chapattis. 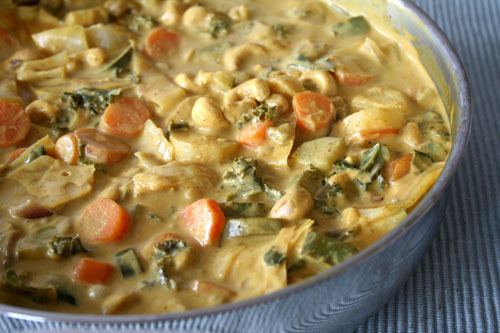 This time round, we used 7 different vegetables in the curry – red onion, garlic, celery, carrot, parsnip, savoy cabbage, and mushrooms, along with cashew nuts and sliced almonds. Lil’ L enjoyed it so much that he asked for seconds! This was our dessert from Monday night. Another really simple recipe which takes about a minute to prepare, providing that you’ve remembered to pre-soak the chia seeds. It’s been another week of great eats 🙂 We’ve had lots of old family favourites and I’ve also been trialling some new recipes which I’m looking forward to sharing with you…. especially the home made veggie pasties, which are totally lush!